Looking for a modern take on a timeless classic? Sometimes we would like to branch out beyond our comfort zone and extend into a more modern sense of style. This sentiment rings true in many aspects of life, including the aesthetics of your home décor. Whether you are looking to improve an outdoor or indoor living space, a fire feature is always a wise decision. But, these days, you have a nearly endless amount of choice when it comes to the fire feature’s design, components, and media. Once you’ve settled on the design and look of your fire feature, it is time to decide on the media. The fire media is simply what you choose to put inside your fire feature and cover the burner. Popular choices are lava rocks and the various possibilities allotted with tempered glass, but you may want to consider the conventional and enduring look of ceramic fire pit logs and fire pit stones. If you are a sentimental spirit with an old soul, perhaps you crave tradition over contemporary appeal? If so, bring “the great outdoors” into your home with the addition of our rustic, yet elegant ceramic log sets and fire stones. Ceramic log sets and fire stones have come a long way in their design and we are proud to offer well-crafted and unique burn media, all of which we believe is the best available on today’s market. Constructed of extremely sturdy and long-lasting ceramic material and available in many styles, our attractive and functional products represent the natural charm fire features yearn for while ensuring you and your guests stay warm in style. To top it all off, despite their natural appearance, our ceramic log sets and fire stones are heat resistant and release ZERO harmful chemicals, while creating ZERO ash and soot! Nothing says tradition like burning logs in a pleasant, toasty fireplace. And, the only thing better than a crackling fire surrounded by your friends and family, is a fire that requires little to no effort to maintain. With today’s modern gas fire features, this is the dream you get to live. Whether you have chosen a fireplace or a fire pit and placed it indoors or outdoors, you now have the opportunity to warm your fingers in toes in a most convenient fashion. Gas fire features are nothing new but, in the past, these imposters tried to pass for the real thing. The anemic blue flames and unconvincing logs fooled no one. Modern versions are often confused for the real thing and offer glowing red embers and tall realistic flames that dance and flicker around ceramic fire pit logs modeled after the real deal. 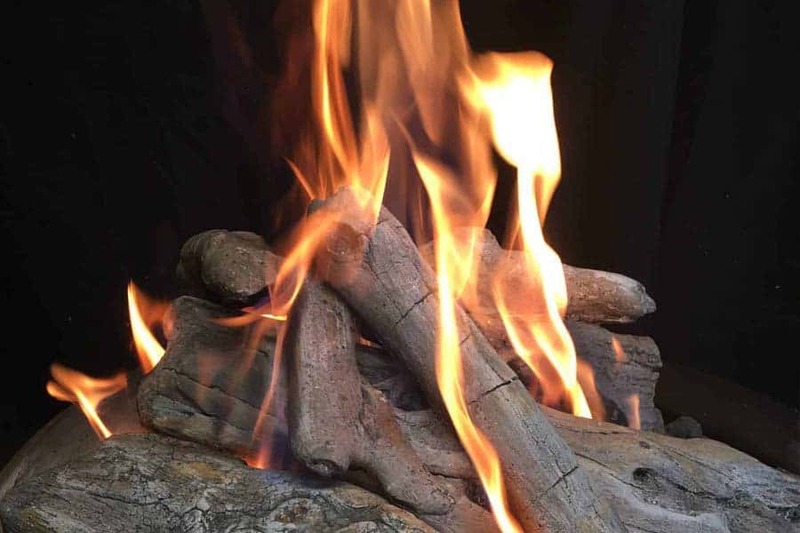 If you want to create the look of natural wood in your fireplace without all the nasty carbon emissions and safety hazards that come with it, allow us to introduce you to the most realistic ceramic fire pit logs available! Our ceramic logs are hand-made and hand-painted and available in a country split, oak deluxe, sierra birch or driftwood. Montana Fire Pits ensures you enjoy the clean heating that gas-fueled fire features offer, yet still relishes the traditional fire experience we’ve all come to know and love. No matter which style you choose, our ceramic fire pit logs mimic those found in the real world. Made in the USA from substantial ceramic, we guarantee that our products will not fail over time. We offer various sizes to accommodate small and large fire features. Our sets are shipped right to your door and arrive as individual fire pit logs that can be arranged by you in any configuration you desire to achieve exactly the look you want. Some of us will never tire of the classic look and functionality ceramic logs bring, but others may want a change. One such change to consider is the minimalistic design and streamlined look that fire pit stones bring to your fire feature. When you think of fire pit stones, you may naturally associate that thought with lava rocks. And for good reason. For years, lava rocks have been the go-to option when it comes to adding stone to your fire feature. In fact, we still recommend adding a base layer of small lava rock underneath whatever burn media you choose. This helps the heat disperse more evenly and efficiently. But fire stones are much more than the roughness associated with lava rock. Formed from heat enduring ceramic, these stones are sleek and smooth, forging the gap between rustic and modern and allowing for a simple, clean, and attractive look that will instantly modernize your fireplace or fire pit. Ceramic Cannonballs: Our ceramic cannonballs are made from the same high-heat resistant ceramic-bonded refractory material we use in the making of our gas logs, yet offer a more a modern flair, for those yearning for an alternative to logs or river rocks. Our ceramic cannonballs give a unique look to your fire feature and will also retain heat and maximize the output of your fire! Our cannonball package prices are based on your fire pit opening and designed to cover your burner and used in conjunction with lava rock. Each package comes with multiple cannonballs and multiple cannonball sizes ranging from 3″- 5″ and may be configured however you like. These cannonball packages assume you have 1″ lava rock covering the pan, plate, and burner to a depth of approximately 3″. Lava rock is not included in this package. Cannonballs are designed to accompany our popular Crossfire Burner kits and your specific fire pit opening. Custom cannonball packages are also available upon request. Ceramic River Rocks: Our ceramic river rocks are made from the same high-heat resistant ceramic-bonded refractory material we use in the making of our cannonballs yet provide more of a classic alternative to cannonballs without succumbing to the uber-traditional log set. River stone is meant to give a natural look to your fire pit and these ceramic river rocks look like nature intended yet will remain intact even with intense heat. 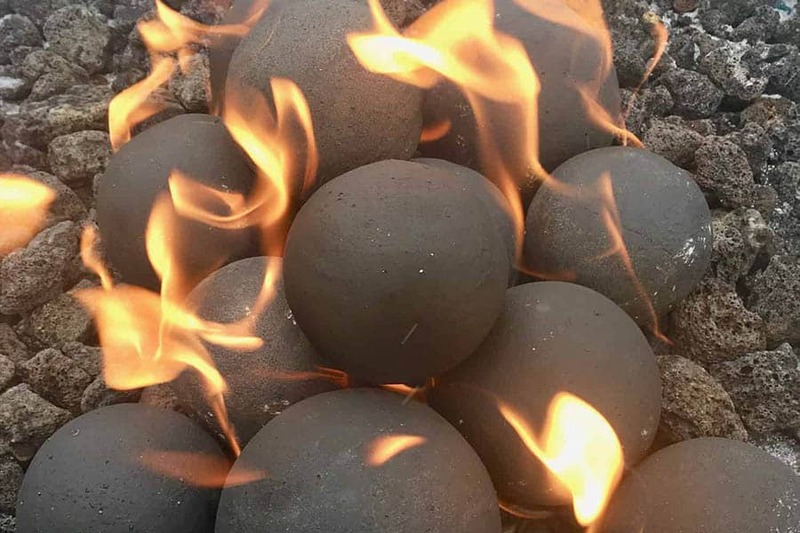 Like our ceramic cannonballs, our ceramic river rocks give a unique look to your fire feature and will also retain heat and maximize the output of your fire! 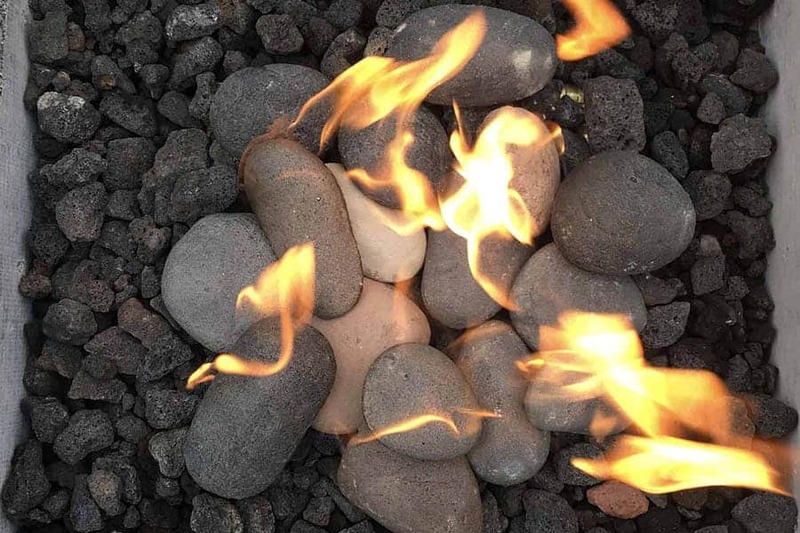 Our ceramic river rock package prices are based on your fire feature opening and designed to cover your burner only and used in conjunction with lava rock. Each package comes with a variety of colors of river rock and may be configured however you like. This river stone package assumes you have 1″ lava rock covering the pan, plate, and burner to a depth of approximately 3″. Lava rock is not included in this package. A 16 stone set covers approximately 224 sq. inches or about 14″ x 16″. Each stone is about 16 sq. inches or about 4″ x 4″. This is the fun part! Do you prefer a more natural looking style? Or are you into the clean and contemporary? You can even mix and match certain styles or even change the burn media out on a rotating basis. Your choice of logs, stone, or cannonballs has little to do with how your fire feature operates. This is truly an opportunity to let your personality shine! Should you find yourself with questions, concerns, or just needed a little guidance, reach out to us today for the answers you are looking for. We are looking forward to the opportunity to warm your life!